Parking: Yoga Sol is located at the neon green balloon on the map. 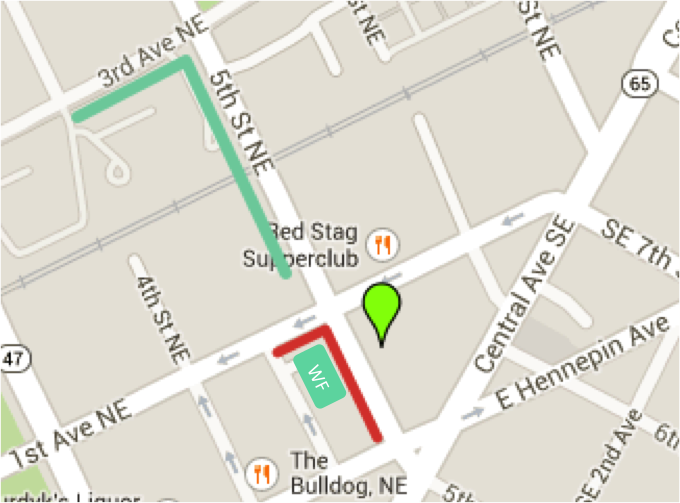 Free parking is indicated by the light green "L" and the green box (Well's Fargo parking lot). Metered parking (@ 50 cents/hr) is indicated by the red "L"
The core of mindfulness meditation is the direct, experiential knowledge of reality. Each weekly session provides group support for one's personal meditation practice and includes a guided meditation, in-depth exploration of a meditation topic, and time for group questions and discussion. The benefits of community and shared learning are a hallmark of each weekly session. This weekly meditation group is entirely donation based. 7/27/16 - Retreat for 18-32 Year Olds w/ Rebecca B., Chas D., JoAnna H.
7/20/16 - The Buddha’s Way to Well-Being & Happiness w/ Howard C. & Lila Kate W.
5/13/15 - The Buddha’s Way to Well-Being & Happiness w/ Howard C. & Lila Kate W.
Alex Haley is the Director of Mindfulness Programs at the University of Minnesota's Center for Spirituality & Healing where he teaches, assists with research and sets the strategy for the mindfulness program area. He has been trained by the Center for Mindfulness, the Somatic Experiencing Trauma Institute, Spirit Rock Meditation Center, the Insight Meditation Society and the Coaches Training Institute. He has practiced meditation for over 15 years, including many months of intensive retreat practice, and worked for start-ups, mid-sized companies and large multinationals both domestically and internationally in legal and business roles. Alex is a founding member of the Mindfulness for Students network and leads residential retreats around the country.